Save Over 50% With eBook Download! By Jack Murray, M.B.A., C.L.I., C.F.E. The phone rings. It's an attorney who wants to know if you can do an automobile accident investigation. What do you say? You say "Yes!" of course, because you have acquired the knowledge and skills necessary for providing this much needed investigative service by studying Accident Investigation in the Private Sector by Jack Murray, M.B.A., C.L.I., C.F.E. You have the inside scoop on all the knowledge gathered from Jack Murray's years of experience as a legal investigator specializing in Accident Investigations. Don't get left out of the loop: read Accident Investigation in the Private Sector Volume 1 to add these skills to your investigative arsenal. Jack Murray delves into all facets of this profitable area of private investigation. Topics include investigative photography, vehicle inspection, accident site inspection, interviewing, testifying in court and much more! Jack Murray's 20+ years of experience in accident investigation means you get to learn all his tips and tricks, and avoid time-wasting mistakes that he's already figured out. You'll also learn how to present the facts of your case to bring out the truth and reveal the real story behind these accidents. The book is spiral bound to allow you to easily copy more than a dozen forms that you'll need to work these cases. Volume One $25.00 By Jack Murray, M.B.A., C.L.I., C.F.E. Save Over 50% Plus Save Shipping Costs As eBook! it in a PDF File. Volume One $12.00 By Jack Murray, M.B.A., C.L.I., C.F.E. Totally Secure 128 Bit Encrypted Easy And Fast Ordering Via Credit Card! Mastercard, VISA, American Express And Discover Cards Welcomed! So you've read Accident Investigation in the Private Sector Volume 1, and you've become an accomplished Accident Investigator... want more? Volume 2 of Jack Murray's excellent series takes you beyond the scope of an Accident Investigator, and gives you the latest formulas, procedures, principles and techniques to turn you from an Accident Investigator into a Accident Reconstruction Specialist and Analyst! This is not a rehash of Volume 1, but a new text which builds on the foundation laid by Jack Murray's award winning first volume. You'll read about important legal issues, new technologies, and advanced methodologies that you'll need to make your investigative practice soar to new heights. Volume 2 combines the expertise and unparalleled investigative experience of Jack Murray with his son Jay Murray's impressive experience as a lawyer / legal strategist. This combination gives you an inside view of the system from both sides of "the bar" and help you to excel in this growing field. If you've read the Volume 1 of the Accident Investigation series and loved it, then you've got to read Volume 2 right away. You'll love this book, and you'll love what it does for your investigative practice. All kinds of state and federal sources and resources you can tap into including free searches you can tap into from state, federal and specialized societies, consumer groups and associations. Volume Two $35.00 By Jack Murray, M.B.A., C.L.I., C.F.E. 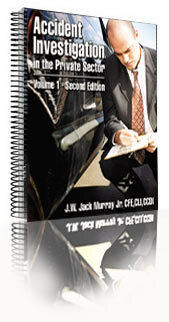 Volume Two $17.00 - By Jack Murray, M.B.A., C.L.I., C.F.E. How To Investigate Big Truck Accidents. Now that you've read Accident Investigation in the Private Sector Volumes 1 & 2, you really know what you're doing when it comes to investigating, analyzing, and reconstructing automobile accidents. But what about 18 wheelers? Do you have the skills and information necessary to deal with these high-value big truck accidents? You will once you've read Volume 3 of Jack Murray's incredible series and start putting his experience to good use. In Accident Investigation in the Private Sector Volume 3, Jack Murray and his son Jay (experienced lawyer & legal analyst) will share with you the investigative techniques that you need to know in order to conduct "big truck" accident investigations. Volume 3 is an excellent look into how Jack Murray has made a very profitable and satisfactory career of working Accident Investigations, with a focus on accidents involving large vehicle accidents. You'll learn the technical know-how and expertise that you need to know to get assigned to these huge accident investigation claims. 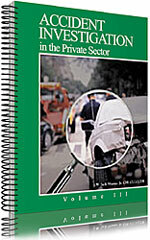 Accident Investigation In The Private Sector Volume 3 can add to the skills and experience you learned from in Volumes 1 & 2, turning you into a professional accident investigator of big truck accidents. You'll also gain the knowledge and insight that will help turn you into the kind of expert witness that is in demand in these legal cases. Why big truck accidents generally result in million dollar plus claims. Compete descriptions of the types of trucks in these investigations. Special bonus: includes the "North American Truck Writer" Glossary of Terms. Thorough explanations of how to properly take photographs to present the best evidence of how and why the accident actually occurred. Explains the importants of multiple angle shots of same scenes for best documentation of accident. How to investigate the sleep habits (or lack thereof) of the driver prior to the accident. Also includes the newly updated rules of the Department Of Transportation (2003). The shortness of this title does not convey the importance of this chapter. Not surprisingly, bad brakes on motor vehicles are one of the leading causes of vehicular accidents. This chapter teaches you what to look for and how when examining the brakes. Also included is a complete glossary of terminology that will help you understand and interpret post crash inspections. An underride accident occurs when a vehicle collides with the side or rear of the trailer portion of an 18 wheeler, essentially "riding under" the truck. These are deadly accidents and need special knowledge and experience to reconstruct and explain. 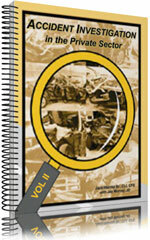 Chapter 5 will give you the expertise to conduct underride accident investigations. Defective or worn tires are a leading cause of truck and passenger vehicle accidents. Learn how to examine the tires of the involved vehicles with detailed information about the subject. Includes D.O.T. rating standards and a complete glossary of vehicle tire terminology. Who was sitting where when the accident occurred? Who was driving? The importance of establishing occupant seating is addressed, revealing the investigative methods you need to establish exactly who sat where just prior to the accident. Confused by Black Boxes? Wouldn't know one if you saw it, or what to do with it? Don't worry: you will have the expertise needed to collect data from black boxes after reading this enlightening chapter. Find out why this is one of the most important pieces of evidence you'll ever collect in a big truck accident investigation. As a bonus, a list of the current passenger vehicles equipped with this technology is also included. Seat belts are subject to significant failure rates, despite the common consumer belief that they are guaranteed to protect them in the event of a crash. Learn about the types of defective belts currently installed in motor vehicles on the road today. Also includes a list of vehicles that have these "suspect" belts. In addition to this excellent work, there are a number of published works that are considered necessary to the success of an accident investigator. The authors present a list of major works with reviews. What resources are there on the Internet that can aid the accident investigator in his work? The authors present a list of the best web sites and resources which apply specifically to the material in this volume, but also in general for all accident investigations. Okay, you are used to accident investigations involving passenger vehicles only. But how much should your retainer be in an investigation involving big trucks and million dollar claims? The authors talk business in this section and give you the info you need when you're approaching the subject of the retainer for one of these accident investigations. Also included is an example retainer form that the authors use in their investigations. Volume Three $35.00 By Jack Murray, M.B.A., C.L.I., C.F.E. 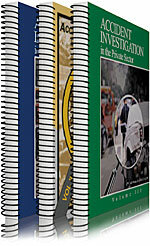 Volume Three $17.00 - By Jack Murray, M.B.A., C.L.I., C.F.E.